I received several bottles of this from Emzi Tinasas who is an official Nu Skin Reseller. And because I have several bottles... I get to keep one for myself and will be giving away the others in my next contest! Yay! 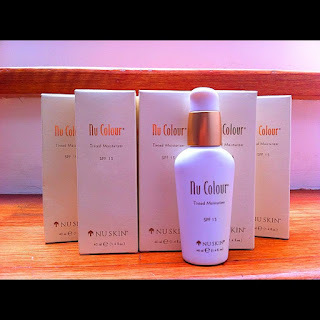 Mirror and reflect your natural skin tone with Tinted Moisturizer. This sheer foundation provides weightless coverage, enhancing your natural skin tone for a healthy glow. The BEIGE (#4) shade that was given to me is a bit dark for my skin tone but after sealing it with a lighter powder (I used Maybelline Clear Smooth All In One Shine Free Cake Powder in Natural #3), the product adjusted to my natural skin tone. As a Tinted Moisturizer, I expected it to be very light but after applying, I realized that it's almost as good as a foundation. If you have good skin, it can be used as a foundation and sealed with powder. Although it doesn't give as much coverage as the foundations I use as a makeup artist, I find that it will do on regular days. For special occasions where you might need more coverage, it can be used as moisturizer and topped with a bit of the foundation you are used to using. It is very lightweight and has SPF 15. Also, I found that it minimized the oil on my T-zone. I like the way that it's packaged and the plastic seal doesn't come off easily so I can put it in my bag without accidentally pressing the pump and spilling product on my stuff. This is the darkest of all four shades available (Fair, Sand, Honey, Beige) but it seemed lighter when applied to my skin. 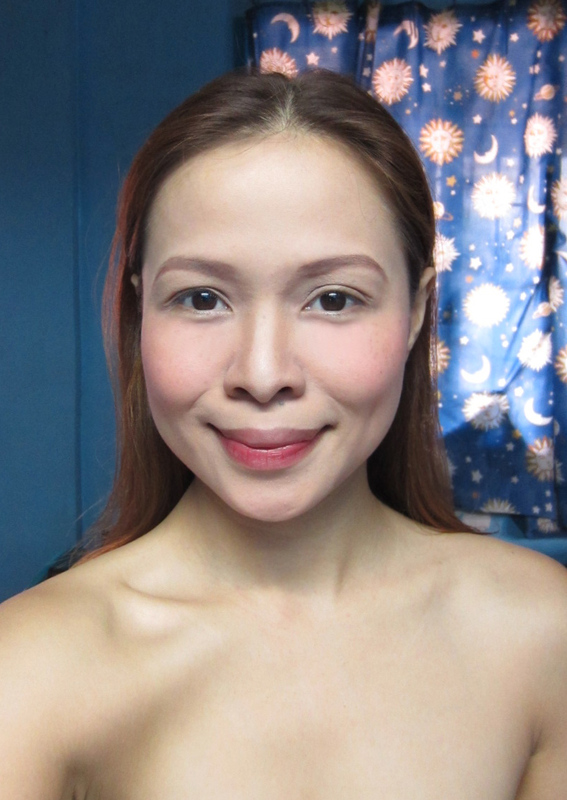 Since it really isn't a foundation with thick coverage, it was pretty easy to adjust with powder on my skin tone. - The price! --- Kaloka! - If you want more coverage, it cannot be used alone. Use it as base and then top with foundation. For people who want a bit of coverage without the heavy feel of foundation. Perfect for those who don't have a lot of skin issues (if used alone). Ok also for those who have some blemishes but used underneaath foundation and set with powder. Works well with any skin type. Here's a close up photo of my cheek. Without anything on (left photo), you can see my freckles. They are very light but still very visible. And with a very light layer of Nu Colour Tinted Moisturizer (right photo), see how it covered my freckles. It didn't cover everything but that's the way I like it (I love my freckles!) So, good job for a tinted moisturizer! I almost forgot that it really isn't a foundation. 2. You can go back to this blog daily to click on the Tweet button for additional entries. That means more chances of winning! 3. Rafflecopter follows EST. Therefore, cutoff daily is at 12 noon. This means you can go back every afternoon to retweet for additional entries. 4. Contest is open to Philippine residents only. 5. Winner will be announced on this blog. Winner will be contacted within 48 hours from the closing date.